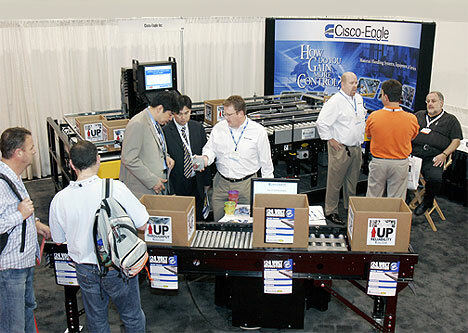 We met a lot of great people, saw some of the latest packaging and handling technologies, and were privileged to debut Hytrol’s innovative E24 conveyor, which can be seen in the foreground of this photo. It’s a revolutionary powered roller design that eliminates the limitations of conventional powered roller conveyor. It’s got about ten times the life of traditional MDR motors because the motors run only when needed. It also reduces the amount of heat in the process, and lowers maintenance dramatically. I’ll have more information, including video, product specs, and literature loaded soon. You can use 1-3/8″ rollers for the first time in a powered roller application. We think this conveyor will be great in packaging lines, linking automation cells, machine feeding, in-motion weighing, assembly applications, food processing, and more. Like I said – keep your eyes peeled, or subscribe to our Material Handling Tips & Info newsletter for updates.